The NASCAR community have suffered a most notable loss on Friday night with the passing of Vice President of Corporate Communications Jim Hunter. Succumbing to cancer after a year-long battle, the 71 year-old Hunter died in Daytona Beach, Florida. Prior to holding this pivotal role for NASCAR, Jim Hunter had long-served within either the stock car sanctioning body or the France-founded International Speedway Corporation in public relation roles. Starting his career at Darlington Raceway as the Public Relations Director, Hunter would return to the famed 'Too Tough to Tame' as a popular president for the speedway between 1993 to 2001. During his time as the head of NASCAR's first major speedway, Jim Hunter under saw the modernization of the track which has allowed Darlington Raceway to remain a relevant stop in stock car racing. First involved with NASCAR in 1968, Jim Hunter presence in the sport extended to relationships with everyone in the major stock car racing organization NASCAR Chairman and CEO Brian France "He loved the sport, but loved the people even more. It seems as if everyone in the sport called him a friend. Jim will forever be missed by the NASCAR community. Our sympathies go out to his entire family.” NASCAR's president Mike Helton also shared feelings of Hunter's. “Jim was a uniquely talented man that cannot be replaced. He was a great friend and mentor to so many in the sport. His influence will remain with and be carried on by so many of the people he touched. This is a sad day for Jim’s family and his extended, NASCAR family.” Helton said. Outside of the NASCAR head office, the praise for Jim Hunter has flooded the Talladega Superspeedway garage area. Jack Roush remembered how Hunter welcomed him into NASCAR. 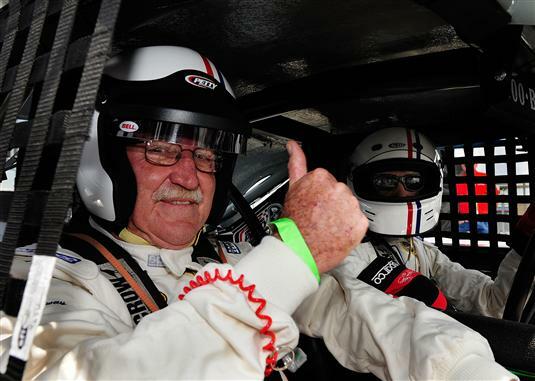 "As a new team owner from the outside joining NASCAR in 1988, I was welcomed and befriended by Jim and his wife Ann in the early days before I was settled, and as I was getting my feet wet in this sport. Past that, Jim remained a friend of whom I could seek sage advice and badly-needed sympathy on more occasions than I can recall. His departure has diminished us all." Roush said. His family requests that those wishing to sent gifts of condolences make donations to the NASCAR Foundation or Hospice of Volusia/Flagler County.